The indoor mobility scooter is a step up from the travel/portable scooters and although both these categories are suitable for use inside a house or apartment the indoor scooters are a little bit larger and more comfortable for longer term sitting. Because the indoor scooters are not intended to be taken apart and transported they can offer some upgrades over the portable scooters. The weight of the components is not as much of an issue with this category of scooter. Scooters normally have either a three or four wheel configuration regardless of the scooter size but the indoor mobility scooters are always three wheeled models. Three wheeled scooters are the best configuration for indoor use because of their shorter turning radius. The four wheeled wheel configuration of many scooters have much too large a turning radius to be used in most houses and apartments. There are two 12 volt batteries in these scooters which are wired in series to give a total voltage of 24 volts to run the motor and any electric accessories installed. Scooter batteries are deep cycle batteries which are designed to provide a low amperage for a long period of time as opposed to a car battery which is designed to put out a lot of amperage for a short period of time. Every once in a while someone will try to save a few bucks by putting a car battery into a scooter. The car battery will be ruined in a few weeks, the warantee will be voided and they will still have to buy the proper batteries in the end. As with any scooter or power wheelchair these scooters are charged with automatic battery chargers which simply plug into the machine. Depending on how depleted the batteries are, it may take 5 to 8 hours to fully recharge and most people plug them in at night to be ready for the next morning. The scooter frames are made of round or square tubular steel and the weight capacity of indoor scooters is usually around 300lbs. 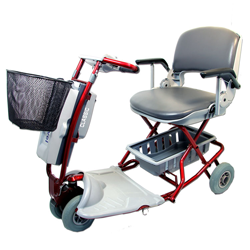 Depending on the model chosen the frame may be adjustable in length but one has to keep in mind that the longer the frame the poorer the turning radius and the less suitable it is for indoor use. Indoor scooters often can be disassembled for transporting but the components are heavier than the portable scooters and disassembly isn't usually quite as easy. The tires on these scooters can be 9" solid but are usually 10" in diameter and about 3" wide filled with either air or foam. Air gives a bit better ride than foam filled tires and are less expensive to replace but they have to be inflated properly for the scooter to perform properly. Just like the tires on a car will lower gas mileage if underinflated, soft tires on a scooter will cause the batteries to need recharging sooner and range of travel will be limited. These scooters will have a flat tread pattern with lots of contact with the floor on the rear tires and the front will be a rounded tire with less contact on the floor to make turning the tiller easier. While considered an indoor scooter the tire size on the indoor model will allow it function fairly well outdoors on lawns and sidewalks. The seats on indoor scooters are usually fairly well padded and intended to be fairly comfortable for sitting over a longer period of time. They may have an adjustable angle back for added comfort and will likely have padding on the arms. To ease transferring on and off the scooter, the arms will flip back or up out of the way and the whole seat will swivel. The tiller of a scooter is where the controls are housed. There will be a lever of some sort which has to be pushed to release the brakes and send power to the electric motor that propels the scooter. When the lever is released the motor stops and the brakes automatically reengage. The scooter key or switch which powers up the scooter is located on the tiller also. For comfort most tillers can be adjusted forward or back to best accommodate the reach of the user.